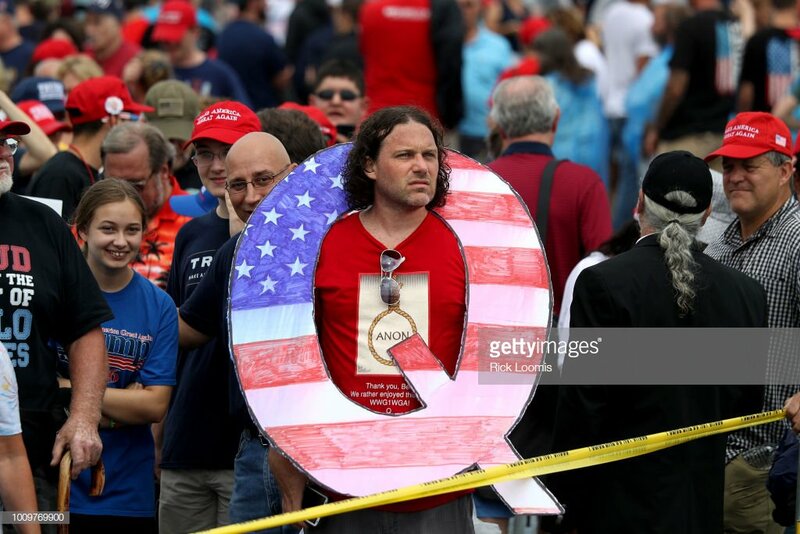 There is another topic here on q, but what is the deal with the kids at the rally. q should be considered, but who is bringing kids to this kind of event where trump spews hatred for the press, and blatantly lies from the podium? I had not heard of q until this week. Not surprising, trump is in panic mode, and is willing to support any wingnut group because his base is shrinking...and he knows it, plus all of the illegal chickens are coming home to roost. He gets press coverage and that is his main objective. Finally, some were suggesting that sometimes the media should just get up and walk out, pulling the rug out from underneath him. But more concerning, I saw for the second time at a rally, in the near past and tonight, half of the people in the tv shot were kids under 11. What is that about? Has he run out of adults, or is he trying to indoctrinate them at an early age? That is striking to me because at that age I had no clue what Eisenhower and Nixon were up to and did not care...until Kennedy entered the picture and the space race really got going. Anybody else notice this or thoughts on it? At Penn rally tonight. I guess Alex Jones isn't sufficiently crazy these days. Bizarre scarcely covers it. I find it scary that the 4chan nonsense has crossed over and is now infecting the Trump base. Combine totally crazy conspiracies that hint at promoting violence with low information folks who will believe anything, and it can get dangerous. Another conspiracy from 4chan is the meme that the "Franklin School of Marxism" is how the country is run by all dems and most R's. Our poster here that likes to bring it up subscribes to several other 4chan conspiracies. It was just five minutes into President Trump's rally in Tampa, Florida on Tuesday when a curious sign was raised by a single attendee amid the usual sea of red 'Make America Great Again' hats. As cable channels ran video of the president welcoming Republican gubernatorial candidate Ron DeSantis to the stage, a page of white printer paper with "WE ARE Q" emblazoned in bold black letters continued to hover above the crowd line, sticking out like a sore thumb.